During 2009 overall consumption of electricity in the U.S. fell by 4.2%, the largest one-year drop in 60 years. Concurrently, the average prices of natural gas (Figure 3) and wholesale electricity (Figure 4) followed suit and fell more than 50%. Business and residential customers alike are looking for a better deal on their electricity purchases, further invigorating an already competitive buyer’s market. Although Texas is still the largest competitive market, 2009 brought some significant changes in other competitive power markets across the U.S. The call for “re-regulation” has subsided in Maryland. With the sharp fall in wholesale prices, buying electricity from the default providers now costs about 15% more than competitive power. The rate of residential customers switching providers is gaining momentum. The current 10% cap on the cumulative amount of competitive sales in Michigan reached its full subscription in about one year. Now customers are pushing to increase or remove the cap in order to encourage companies like Constellation Energy to come to the state and compete for electricity sales. After deregulating in 2000, California later reregulated while allowing customers who switched during the open window to stay with their electricity provider of choice. Senate Bill 528, enacted in October 2009, has reopened the window for more competitive power sales. Each of the three major investor-owned utilities must allow nonresidential customers to switch to an electricity provider of their choice effective April 16, 2010. However, here’s the catch: Like Michigan, California has established a cumulative cap on the direct access mandate. So many customers want to change suppliers that a lottery system has been set up. Only 50% of the new direct access allowance can be implemented during 2010. The balance becomes accessible in 2011 (20%), 2012 (20%), and 2013 (10%). The Keystone State is now the fastest growing state for competitive power, and residential customers are changing their electricity providers at a torrid pace. The changes began in 1997 when deregulation was introduced as Pennsylvania competed for industry and jobs. While businesses were given a choice of electricity providers, few customers elected to leave their incumbent provider because, if you jumped ship, you had to pay the “stranded cost” as part of the deal. Regulated utilities were allowed to recover their stranded costs over a maximum of 10 years, during which time there would be a rate cap. The rate caps began expiring in some regions as early as 2002, but the first highly populated region to see the rate caps lifted was the PPL service territory at the end of 2009. Metropolitan-Edison, Pennsylvania Electric, PECO Energy, and West Penn Power will have their rate caps expire on the last day of this year. During the first two months after PPL’s rate cap was removed, more than 24% of its residential customers changed to a competitive supplier. This switchover rate far exceeds the rate in the first 60 days in any competitive market, including the Electric Reliability Council of Texas (ERCOT). The reason is easy to understand: price. Customers can obtain a price reduction of 10% to 30% by switching and always have the opportunity to switch back to their default provider. In 1998 deregulation of the electricity industry was all the rage in the U.S. More than 35 states were working, with different degrees of conviction, to establish competitive power and supplier choice for residential, commercial, and industrial customers. Flash forward 12 years and only one state has unequivocally succeeded in deregulating electricity: Texas. All things are said to be large in Texas, but there is no question that electricity consumption walks the talk. Texas has the largest power market in the nation at 347 million MWh in 2008, distancing itself from California in electricity sales. In fact, Texas is a 29% larger market, and ERCOT is 16% larger market, than California. ERCOT electricity sales are 8% of total U.S. sales. 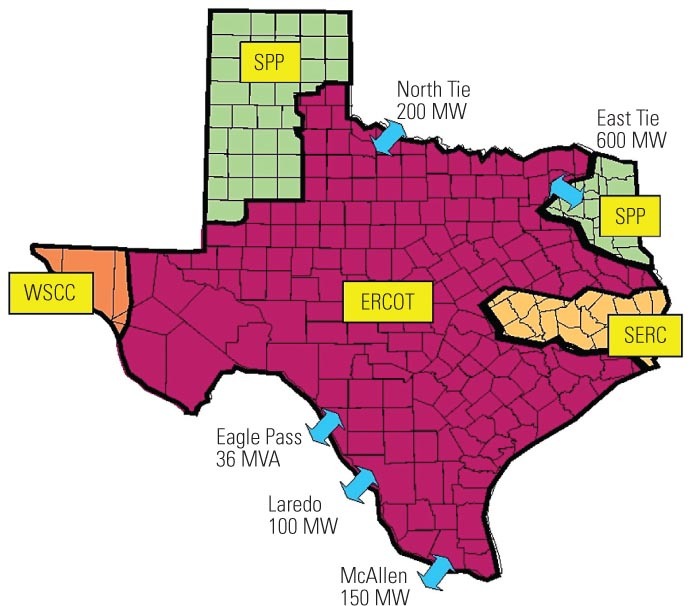 Ironically, the ERCOT region of Texas is surrounded by other electrical regions that remain regulated (Figure 5). 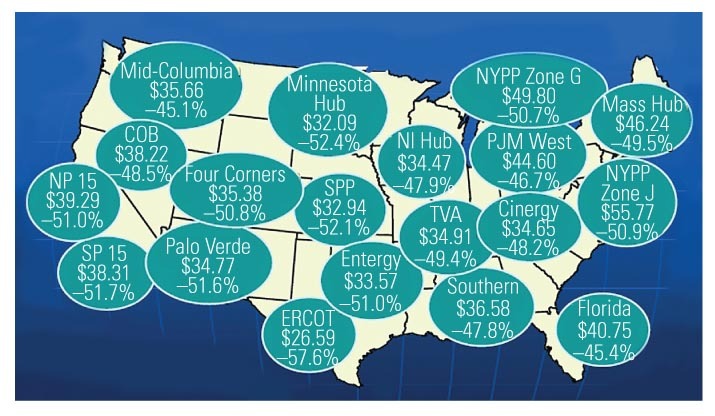 ERCOT naysayers argue that the Texas model has resulted in higher electricity prices. 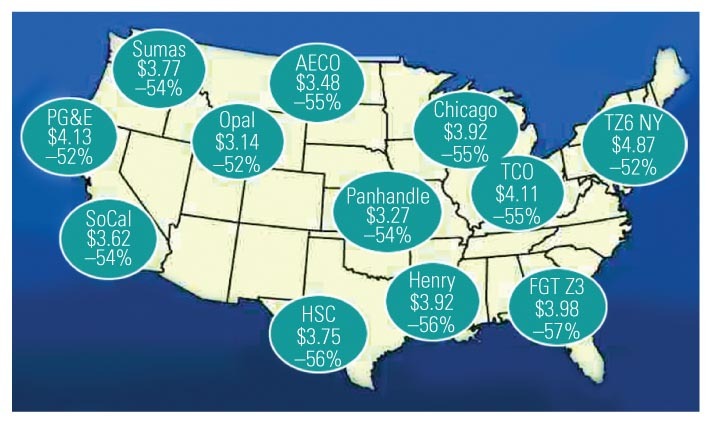 Since the Texas markets have been opened, the price of electricity has indeed fluctuated with the price of natural gas, given that 42% of ERCOT’s electricity is fired by that fuel. Today, natural gas is low in price, but historically prices have fluctuated wildly. However, of the five most populous states in the U.S., only Illinois, which derives a high fraction of its electricity from nuclear and coal-fired plants, has a lower average wholesale price of electricity than Texas. Texas also enjoys very competitive rates compared to other gas-intensive states. However, to be fair with the comparison, that sample includes just nine states. Since the deregulation of ERCOT starting in 1999, more than 50% of residential customers and more than 75% of commercial and industrial load have changed their retail provider at least once. Though many people think of electricity as a commodity and price as the only differentiator, innovation and creative marketing have flourished. Today in Texas you can buy electricity at a fixed price with a contract term of six months, one year, or two years. On the other hand, you can play the market by choosing a rate with a variable price that is lower today but subject to change with the price of fuel. You can buy green electricity, all wind electricity, or electricity with frequent flier miles on your favorite airline. You can buy electricity with time-of-day metering, or you can lease solar collectors in order to buy less electricity. You can prepay your electricity or give a prepaid amount of electricity with a gift card (do not try this on your wedding anniversary). Turn on the TV in Houston or Dallas and you will listen to numerous retail electricity providers tell you in 30 seconds why you should switch to their company. And when you decide to switch, the change can be completed in less than a week, without ever having a person show up at your home or business. With 5 million smart meters now being installed in ERCOT, the experts are predicting that even more innovative products and service offerings are just around the corner. This is the future of the retail electricity business.